This is a list of the extreme points of the United States, the points that are farther north, south, east, or west than any other location in the country. Also included are extreme points in elevation, extreme distances, and other points of peculiar geographic interest. Extreme points in all U.S. territory: Point Barrow, Rose Atoll, Wake Island, Peaked Island (red dots); Point Udall, Guam, and Point Udall, USVI are shown as green dots. The International Date Line is shown in yellow. Alaska has the northernmost geographic center of all the states. North Dakota has the northernmost geographic center of the 48 contiguous states. 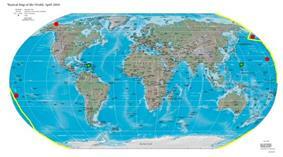 Note that maps of the 48 states that are displayed in a non-cylindrical projection (i.e. curved lines of latitude) can give the impression that the state of Maine extends farther north than it actually does. The northernmost point in Maine is at approximately 47.46 degrees North latitude. This line of latitude passes through the southern suburbs of Seattle. From there, it is approximately 100 miles (160 km) north to the 49th parallel. A wide swath of land within the 48 states (encompassing portions of Washington, Idaho, Montana, North Dakota, and Minnesota) is therefore farther north than any place in Maine. Included in this area are such places as Spokane, Washington; Coeur d'Alene, Idaho; Great Falls, Montana; Minot and Grand Forks, North Dakota; and Bemidji, Minnesota. Even Isle Royale and parts of the Upper Peninsula of Michigan (such as the Keweenaw Peninsula) are farther north than anywhere in Maine. By comparison, the southernmost land in Canada, Middle Island, Ontario, at a latitude of North 41°40'53", lies entirely south of 12 of the contiguous states - Washington, Idaho, Minnesota, Montana, North Dakota, Michigan, Maine, Wisconsin, Oregon, South Dakota, New Hampshire and Vermont - and south of the northernmost border of 14 more of the contiguous states. Cameron County, Texas- 25°50'14.5"N 97°23'39.9"W Southernmost point in 48 contiguous states mainland and with Mexican border. Hawaii has the southernmost geographic center of all the states. Florida has the southernmost geographic center of the 48 contiguous states. Note that maps of the 48 states that are displayed in an equal-area projection can give the impression that the state of Texas extends farther south than it actually does. The southernmost point in Texas (just southeast of Brownsville) is at approximately 25.50 degrees North latitude. This line of latitude passes through Hialeah, Florida, which is slightly north of Miami. Pochnoi Point, Semisopochnoi Island, Alaska – easternmost point in all U.S. territory by longitude -- ironically, in the Alaskan Aleutian Islands "west" of the westernmost point in the US by longitude (Amatignak Island) due to interposition of 180° longitude, which conventionally divides "west" from "east" in geographic terms. Maine has the easternmost geographic center out of the 50 states. Note that maps of the 48 states that are displayed in an equal-area projection can give the impression that the state of Florida extends farther east than it actually does. The easternmost point in Florida (Palm Beach Shores) is at approximately 80.03 degrees West longitude. This line of longitude passes through (or near) such places as Pittsburgh and Erie, Pennsylvania – farther west than all of New York, New Jersey, and all of the New England states. Amatignak Island, Alaska – technically, westernmost point in all of US territory by longitude, but not the westernmost of the US Aleutian Islands. It possesses the highest longitude west figure (179°8'55"W) before 180° longitude, which passes west of it. After 180°, longitude is termed "east" and declines numerically. Hawaii has the westernmost geographic center of all the states. Oregon has the westernmost geographic center of the 48 contiguous states. Note that maps of the 48 states that are displayed in an equal-area projection can give the impression that the state of California extends farther west than it actually does. The westernmost point in California (Cape Mendocino) is approximately seven miles east of the westernmost point in Oregon (Cape Blanco), and approximately 14 miles (23 km) east of the westernmost point in Washington (Cape Alava). One method is to use the Prime Meridian as the dividing line between east and west. This meridian running through Greenwich, London, is defined as zero degrees longitude and could be called the least eastern and least western place in the world. The 180th meridian, on the opposite side of the globe, is therefore the easternmost and westernmost place in the world. Still another method is to first determine the geographic center of the country and from there measure the shortest distance to every other point. All U.S. territory is spread across less than 180° of longitude, so from any spot in the U.S. it is more direct to reach Point Udall, U.S. Virgin Islands, by traveling east than by traveling west. Likewise, there is not a single point in U.S. territory from which heading east is a shorter route to Point Udall, Guam, than heading west would be, even accounting for circumpolar routes. The two Udalls for whom the two Points are named were brothers, Mo Udall in Guam and Stewart Udall in the Virgin Islands. International Falls, Minnesota Geographic center near the 49th parallel. Distance from ocean about 1,600 miles (2,600 km). Closest to the equator: Baker Island is located at . The geographic center of the North American continent is located at , about 6 miles (9.7 km) west of Balta in Pierce County, North Dakota. The North American pole of inaccessibility is located at , about eleven miles southeast of the town of Kyle on the Pine Ridge Indian Reservation in Bennett County, South Dakota, 1,025 miles (1,650 km) from the nearest coastlines. Greatest north-south distance in the 48 contiguous states: 1,650 miles (2,660 km). Greatest distance between any two points within U.S. Territory: 9,514 miles (15,311 km) from Point Udall, Guam to Point Udall, St. Croix, U.S. Virgin Islands (formerly known as Orote Point and East Point, respectively). Greatest distance between any two points within the 50 states: 5,859 miles (9,429 km) from Kure Atoll, Hawaii to Log Point, Elliott Key, Florida. Greatest distance between any two points within the contiguous 48 states: 2,901 miles (4,669 km) miles from North Farallon Island, California to Sail Rock, east of West Quoddy Head, Maine. Greatest distance between any two mainland points within the contiguous 48 states: 2,892 miles (4,654 km) from Point Arena, California to West Quoddy Head, Maine. Greatest distance between two points on the same latitude: 5,823 miles (9,371 km) from Kure Atoll, Hawaii to Riviera Beach, Florida. Note that some map projections make diagonal lines appear longer than they actually are. However, the diagonal line from Kure Atoll, Hawaii to West Quoddy Head, Maine is only 5,797 miles (9,329 km) and the diagonal from Cape Wrangell, Attu Island, Alaska to Log Point on Elliott Key, Florida is only 5,505 miles (8,859 km). ^ Donald Winslow Carson; James W. Johnson (2001). Life and times of Morris K. Udall. University of Arizona Press. p. 220. ^ The summit of Mount McKinley is the highest point of the Alaska Range, the State of Alaska, the United States of America, and all of greater North America. Mount McKinley is the third most prominent summit on earth. ^ "Mount McKinley". Summits of the World. peakbagger.com. Retrieved September 8, 2012. ^ The summit of Mount Whitney is the highest point of the Sierra Nevada, the State of California, and the contiguous United States. ^ "Mount Whitney". NGS Station Datasheet. ^ "Mount Whitney". Summits of the World. peakbagger.com. Retrieved September 9, 2012. ^ The summit elevation of Mount Whitney includes an adjustment of +1.869 m (+6.1 ft) from NGVD 29 to NAVD 88. ^ The summit of Grays Peak is the highest point of the Front Range and the Continental Divide of North America. ^ "Grays Peak". NGS Station Datasheet. ^ "Grays Peak". Summits of the World. peakbagger.com. Retrieved September 8, 2012. ^ The summit elevation of Grays Peak includes an adjustment of +1.881 m (+6.2 ft) from NGVD 29 to NAVD 88. ^ The summit of Mauna Kea is the highest point of the Island of Hawaiʻi, the State of Hawaiʻi, and the entire Pacific Ocean. Mauna Kea is also the tallest mountain on Earth as measured from base to summit. The shield volcano sits on the ocean floor at a depth of 5,998 meters (19,678 ft) for a total height of 10,203 meters (33,474 ft). ^ "Mauna Kea". Summits of the World. peakbagger.com. Retrieved April 1, 2012. ^ "About Taos Ski Valley". Taos Ski Valley Chamber of Commerce. Retrieved 2012-02-29. ^ Furnace Creek, in Death Valley, California, set the world record for the highest reliably reported ambient air temperature of 134 °F (57 °C) on July 10, 1913. This record has been eclipsed only once by a questionable reading of 136 °F (58 °C) recorded in 'Aziziya, Libya, on September 13, 1922. ^ Two identical soundings at 47° 45.2'N, 122° 26.0'W and 47° 44.6'N, 122° 25.4'W on NOAA chart 18446, Puget Sound: Apple Cove Point to Keyport, scale 1:25,000, 2005. Chart datum (as shown on the chart) is lower low water. ^ "State University Encyclopedia: Equator". State University Encyclopedia. Retrieved 2009-07-03. ^ "CIA World Factbook: Jarvis Island". CIA World Factbook. Retrieved 2009-07-03.